On admiring pharmaceuticals in London « "TeresaBruceBooks"
Hours waiting at customs, TSA officials looking at see-through body scans of your junk, schlepping cases of photo gear around corporate offices – all of this is the decidedly non-glamorous side of producing corporate videos. But when you have a Sunday off in London and get to see the hottest new exhibit at the Tate Modern – it’s hard to beat. Hence my photographic homage to Damien Hirst above – on the left: his life-size pharmacy room and on the right: me on location at the corporate headquarters of the health care company we were shooting. Not bad eh? I knew I’d be shocked and awed by the outrageous Hirst pieces – the shark suspended in a tank, the stained glass windows made of butterfly wings, the severed head of a cow designed to grow maggots etc. I didn’t expect to be as moved as I was by his series of stainless steel cabinets containing facsimile pills – each one individually produced to replicate actual medicine. 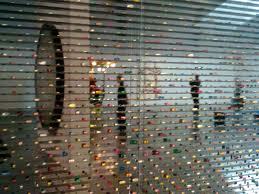 They’re beautiful, set against the mirrored background that forces you to see yourself in the pills we all consume. I complain about Gary’s collection of dead things he photographs, but at least we don’t have a wall-sized disc of black flies or a wall dripping with butterfly-hatching goo. Maybe that’s why I loved the video on the bottom floor of the Tate where Hirst recalls his mother saying, “Oh for the love of God,” every time he started a new project. 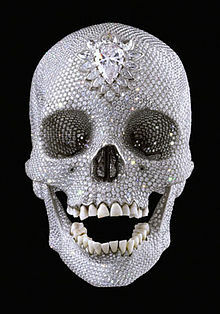 It’s the title of the centerpiece in the show: the diamond-encrusted human skull. If only I could get Gary to start lining all of his deer jaws with rubies or jade…. 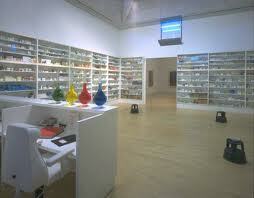 This entry was posted in travel and tagged Pharmacies, Tate Modern.